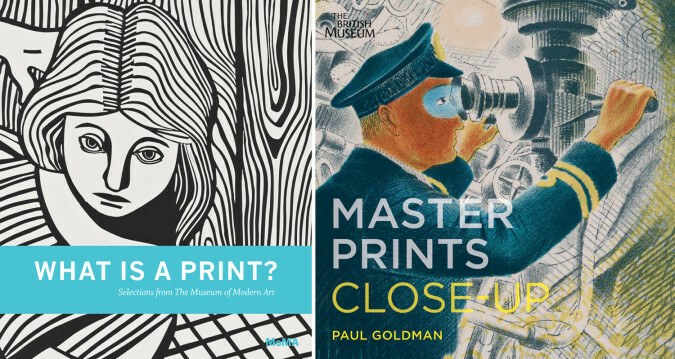 Both of these appealing books aim to be user-friendly introductory guides to the presumptively inaccessible world of prints. That prints are perceived as requiring special knowledge to appreciate is one of the great ironies of the medium whose original raison d’être was to be both popular and populist. Yet it is undoubtedly the case: it is common enough to hear museum visitors mutter that they don’t know anything about prints as they speed off to the painting galleries. The situation is exacerbated by the fact that most people just don’t get to see many prints. Given the susceptibility of ink and paper to light damage, the walls of even the most print-friendly museums are dominated by other media, and no matter how kindly the staff, print rooms, with their low light levels and hushed ambiance can be more than a little off-putting. 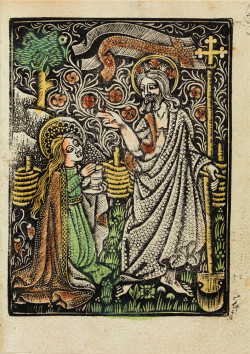 Anonymous (German School), Christ Appearing to St. Mary Magdalene (c. 1460-70), metalcut with hand-colouring, 10.2 x 7.7 cm. PD 1872.0608.380. ©Trustees of the British Museum. The museum gift shop therefore beckons as the easy access, unintimidating venue through which to entice the general public into the pleasures of the print. This is clearly what these books were designed to do: each acts as a showcase for the print collection of its respective institution, each would look handsome on a display table, and each is modest enough to slip into the tote bag without breaking the bank or straining a shoulder. The British Museum’s Master Prints Close Up is the more self-effacing of the two: a compact paperback, it takes just 45 works from the museum’s collection of more than two million prints and flanks them with a five-page introduction at the front and a five-page glossary of terms at the back. Former BM curator Paul Goldman explains the book’s purpose as simply “to introduce the general reader and art-lover to a selection of masterpieces.” (This oddly Victorian tone continues throughout; one wonders how many contemporary readers will be helped by the author’s explanation of an intaglio press as comparable to ‘a clothes mangle.’) Words, however, are not really the point here. Images are the core of this book and the images are riveting. 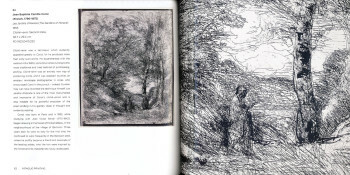 Each of the 45 works, from the 15th-century hand-colored metalcut that starts things off to the Richard Hamilton digital print that wraps things up, receives its own spread: the left-hand page carries a thumbnail reproduction and a couple of paragraphs of background information about the artist, the style or the subject matter, while right-hand page is taken up with a full-bleed, beautifully printed, enlarged detail. This is a simple device, but effective: it offers up to the eye precisely those attributes about which print people wax poetic—the dynamic intricacy of that metalcut, the chalky crumble of Boucher’s crayon manner—attributes that are often lost under glass on the rare occasions these things go on view. Spread from Master Prints Close-Up. Jean Baptiste Camille Corot, Les Jardins d’Horace (The Gardens of Horace) (1855), cliché-verre, second state, 36.7 x 29.4 cm. PD 1922.0410.222. ©Trustees of the British Museum. Goldman makes the most of his format, selecting works of quite divergent material character, and he has augmented the standard litany of woodcut-etching-lithograph-screenprint with a welcome sprinkling of more esoteric techniques—a Gino Severini pochoir as flat and milky as wallpaper; a wonderfully sketchy Corot cliché verre (mysteriously included in the Intaglio section); a full-color 18th-century stipple engraving after Angelica Kauffman. 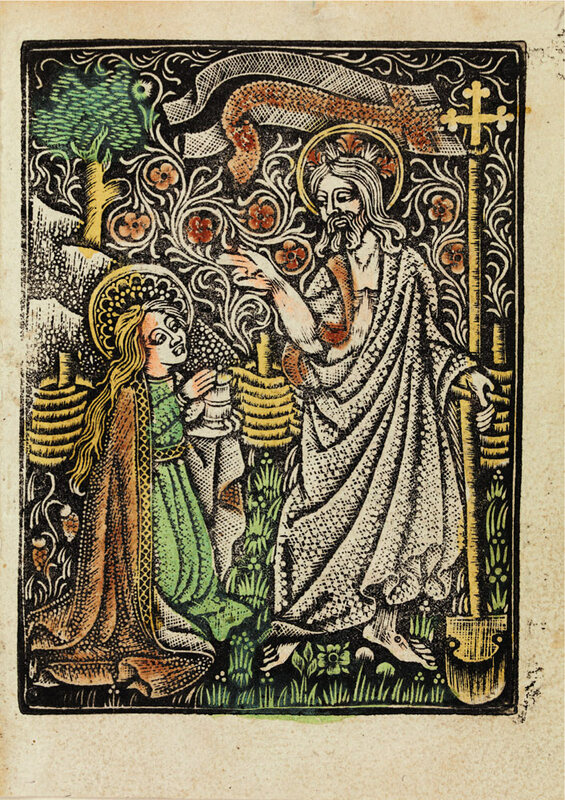 Covering half a millennium of Western printmaking, this is very much a historical overview; only seven of the included works postdate World War II. The Modern’s approach is more… well… modern. 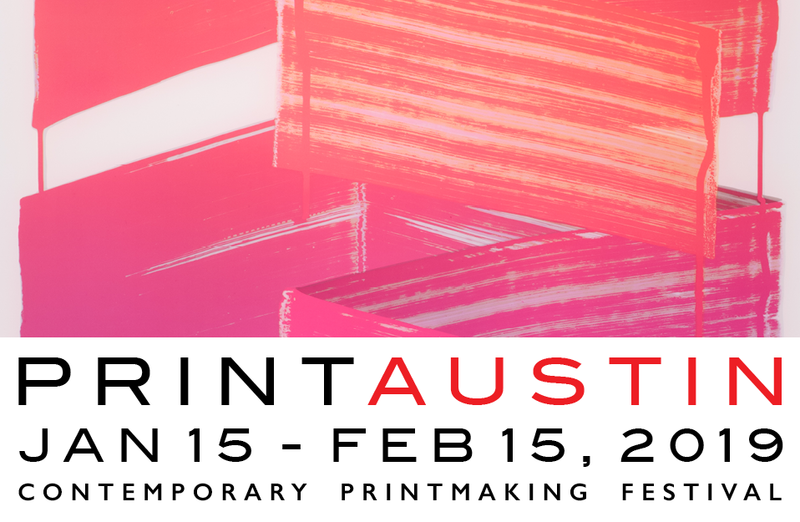 What is a Print? is in fact a follow-up to the museum’s website of the same name (http://www.moma.org/whatisaprint), which offered nifty little animations of the four basic printmaking techniques along with a gallery of works; a thorough glossary and a list of recommended reading. For basic print education the site is very useful, but it has its limitations: the images are small and unzoomable, the glossary is frustratingly unsearchable; the texts minimal and larger contextualization is absent. Sarah Suzuki’s handsomely produced book goes some way to addressing these shortfalls, with more works, larger reproductions and short introductions to each technique. The selection of works only partly duplicates the website, and includes imaginative additions like the stone for Jasper Johns’ 0-9 portfolios (1960-63); the copperplate for Lucian Freud’s Head of an Irishman (1999); and the woodblock of Donald Judd’s Untitled (7-L), which clearly doubles as a sculpture. Gert and Uwe Tobias, Untitled (figure) (2005). The Museum of Modern Art, New York. Fund for the Twenty First Century. ©2011 Gert and Uwe Tobias. Photo: John Wronn. Suzuki’s tone is more bracing and adventurous than Goldman’s: having defined the print as “a work of art that is made by transferring an image from an inked surface to a sheet of paper and that exists as one of multiple impressions” she writes: “Now take that simple answer and explode it.” Thus we get a 6 1⁄2 foot tall woodcut from Gerd & Uwe Tobias, one of Eugenio Dittborn’s mail art works, and Paul Noble’s 2002 wallpaper. 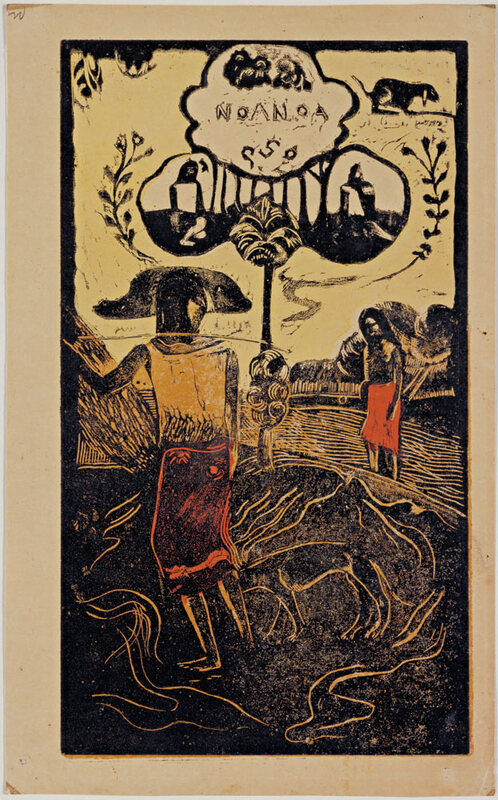 It is no surprise to find that chronological balance is tipped in the opposite direction from the British Museum: there is nothing before Paul Gauguin’s Noa Noa woodcuts of 1893-94, and she includes as many prints from the first decade of the 21st century as from the entire first half of the 20th. 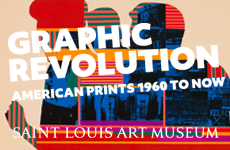 The point—that the print is an absolutely current and vital form—is further made by the fact that brand-new works were commissioned to head each of the book’s chapters: Christiane Baumgartner for woodcut; Julian Opie for screenprint; José Antonio Suárez Londoño for intalgio; and Terry Winters for lithography. This brings us to my one quibble with both books (which extends to almost all books on the subject), which is to do with the decision to organize the art by technique. While it is true that bafflement about how prints are made can put people off, a case could be made that the persistent foregrounding of technique in introductory books such as these sends a signal that the most important thing about prints is not how they look, or the ideas they carry, or how they function in the world, but the facts of their material production. Mass-market books on painting are rarely if ever organized by “acrylic on canvas,” “tempera” or “oil on board;” instead aspects of content or style are given pride of place, and the technical detail is filled in as necessary. My hope is that readers of these books will be sufficiently entranced by the images to ignore the chapter headings. 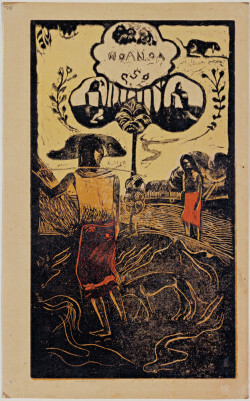 Paul Gauguin, Noa Noa (Fragrance) (1893–94). The Museum of Modern Art, New York. Lillie P. Bliss Collection. Photo: Kate Keller. Both authors deserve credit for mixing obvious choices (Dürer and Rembrandt for the BM, Picasso and Warhol for MoMA) with quirkier and less familiar works. Goldman’s selection is particularly strong in British prints: a linocut by Claude Flight (who is also included in the MoMA book), reproductive Dalziel Brothers wood engravings, Grayson Perry’s Map of an Englishman. 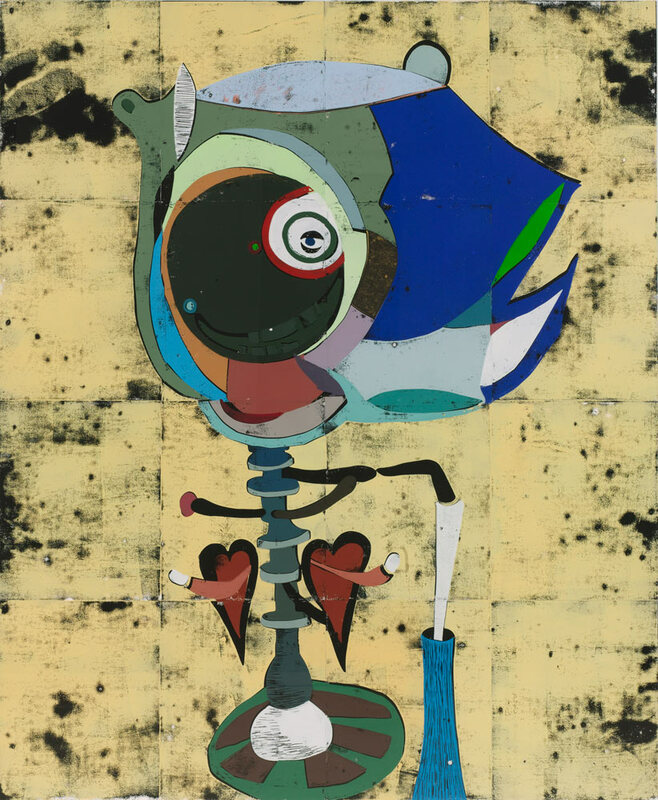 Suzuki’s contains a global array of artists under the age of 40: Seher Shay, Tabaimo and Christoph Ruckhäberle, among others. There is, as the saying goes, something new for everyone. Both authors have put together books that are visually engaging, tidily informative, and fun to dip in and out of, but have quite different strengths and emphases. For Suzuki, the print is a locus of dynamic contemporary creativity, a pot very much on the boil; for Goldman it is a glorious, historical form “just as valid and significant as an oil painting.” They’re both right.